It's Doors Open weekend here in Toronto and Gord and I like checking them out. Gord and I did the Industry and Internment in Liberty Village tour this afternoon in our 'hood, led by Richard Fiennes-Clinton, owner of Muddy York Walking Tours. We've done some of Richard's past walks and found them interesting. I read his book Muddy York: A History of Toronto until 1834 earlier this year and enjoyed it. The tour started at Hanna Avenue/Liberty Street. We walked west a couple block to Liberty Street/Jefferson Avenue and learned about the Mercer Reformatory for Women. It opened in 1872 with the idealistic promise of a "homelike" atmosphere for its inmates. One of the major tenets of the reformatory was to instill feminine Victorian virtues such as obedience and servility. 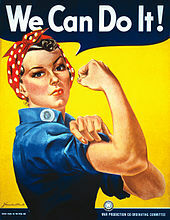 Work, such as cooking, baking, and cleaning, was also a major part of prison life. Many young women who were labeled troublemakers by officials or who might have been unwed mothers were sent to reformatories such as the Mercer Reformatory, where they were held against their will and subjected to questionable medical experimentation. It became the centre of controversy with allegations of torture, beatings, experimental drugs and medical procedures, all in the name of reform. It was closed in 1969. We then walked east to the Liberty Market Building. Back in its day, trains used to travel along tracks to pick up the guns being manufactured here for the war use and delivering coal and supplies to the industries ... now it's trendy shopping and restaurants. I used to take boxing classes there about ten years ago before they revitalized the building. We headed east again and stopped by the Toronto Central Prison Chapel (1877 - 1915), which was a Catholic prison chapel. 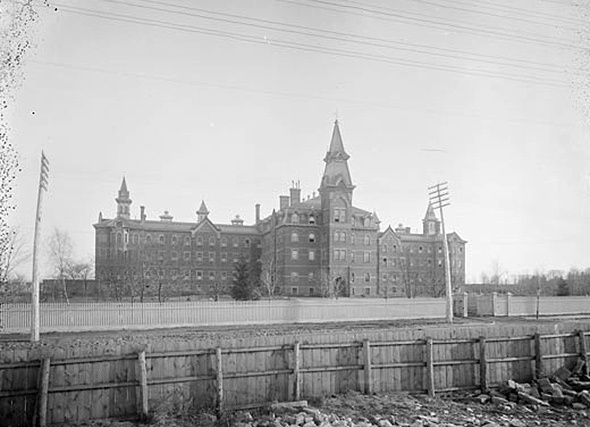 It is the last remaining building of the Toronto Central Prison complex. The chapel was built by the prisoners and is on the city's list of heritage properties (so is protected from demolition). We headed east along East Liberty Street. 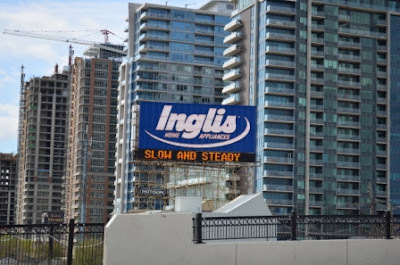 We stopped to hear more about John Inglis Co. Ltd., which was a Canadian firm that made weapons for the United Kingdom and British Commonwealth military forces during World War II and then became a major appliance company (now Whirlpool Canada). There used to be a big Inglis sign just south ... it was erected in 1975 and removed in 2014. 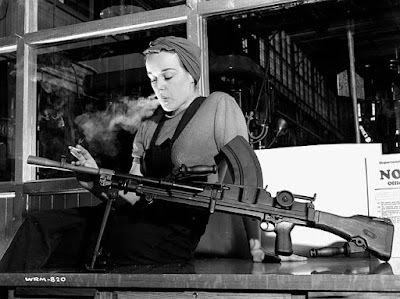 Richard also told us about Veronica Foster aka "Ronnie the Bren Gun Girl", who was a Canadian icon representing nearly one million Canadian women who worked in the manufacturing plants that produced munitions and material World War II. She worked for John Inglis Co. Ltd. producing Bren light machine guns on a production line. Stopping just north of the train tracks at Wellington Street/Strachan Avenue, Richard told us about the "Toronto". 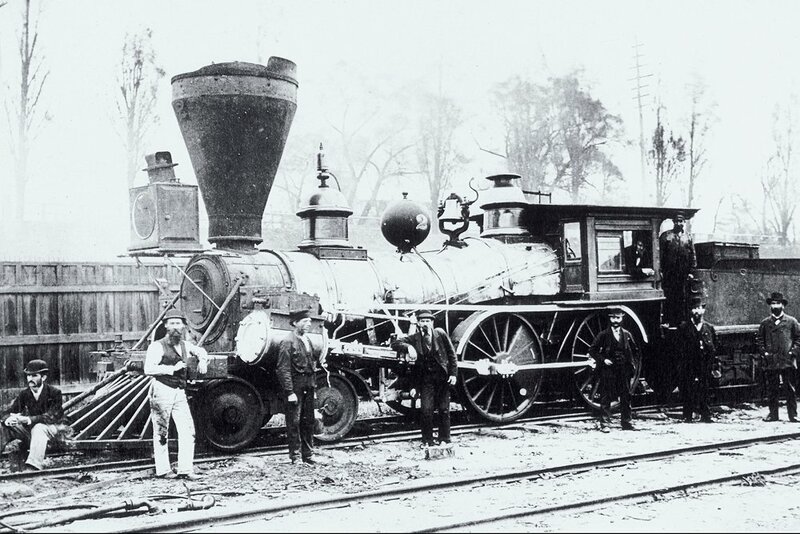 In 1853, the Toronto Locomotive Works built the first steam locomotive manufactured in Canada. 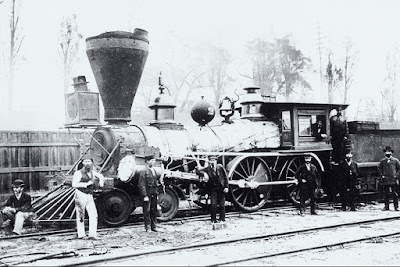 The new locomotive was completed in April 1853 and named "Toronto". To get the locomotive to Front Street where the closest tracks were, temporary tracks were laid and the locomotive was slowly moved with crowbars a few inches at a time and the tracks behind the Toronto were then taken up and relaid in front of the engine (it took five days). The Toronto was scrapped in 1881. Our final stop was the former headquarters of Massey-Harris at Strachan Avenue/King Street W, the last remaining building on what once encompassed 11 acres (it's now condos). Richard told us a bit about the influence of the Masseys (Massey Hall, Hart House, etc.). This was an interesting tour, especially since it was in our walk. As usual, we learned a lot from Richard!